This slow cooker chicken and rice soup is an easy and comforting meal that’s perfect for cold nights! My slow cooker is my go-to for those extra busy days when it seems like I’ll never have time to make dinner! 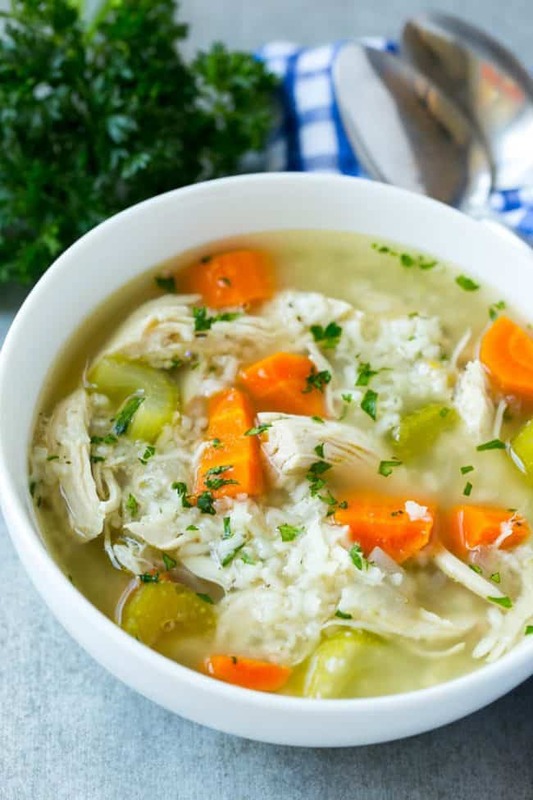 This chicken and rice soup is a family favorite; it’s healthy, easy to make and kid friendly. 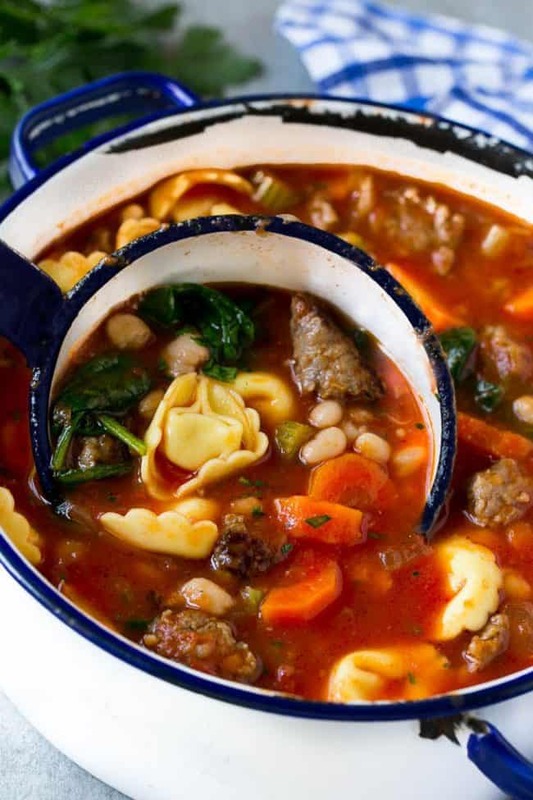 It’s great for a chilly day or for when you’re feeling under the weather. Best of all, it’s super easy to make! 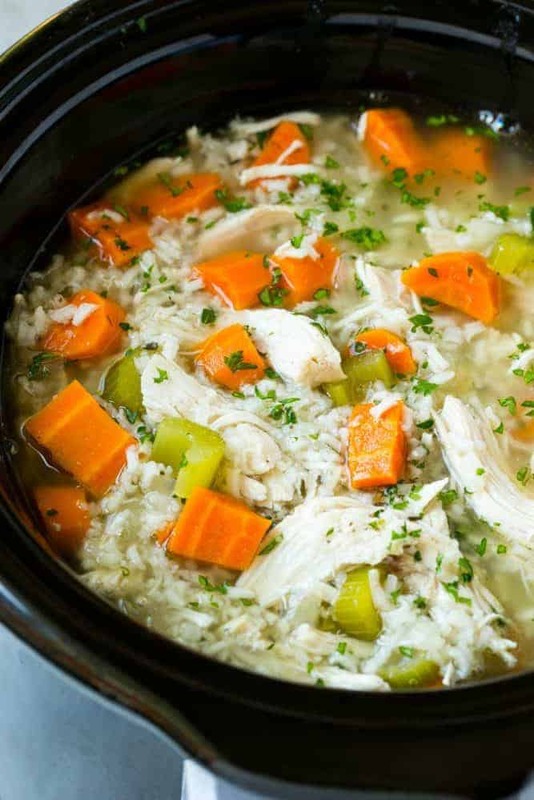 The ingredients for this slow cooker chicken and rice soup are quite simple. We’ve got veggies, chicken breasts, chicken broth, garlic and herbs. 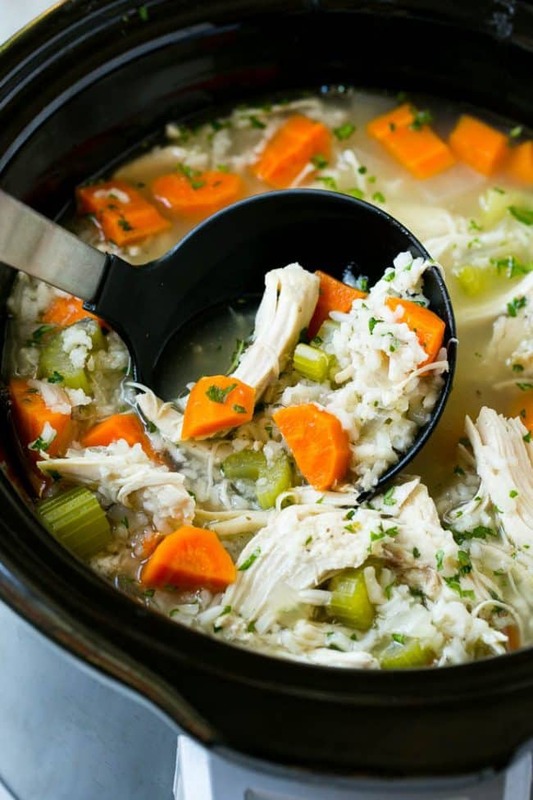 One pitfall to making chicken and rice soup in a slow cooker is that if you put the rice in with the other ingredients in the morning, it will be quite soft by the time you’re ready to eat. Some people don’t mind this, but others prefer their rice to be on the firmer side. If you choose to put your rice in at the beginning of the cook time with the other ingredients, you’ll want to use brown rice as it will stand up to the long slow cooking process. What I typically do is add the rice during the last hour of the cook time. Another alternative is to simply stir some cooked rice in right before you’re ready to eat. However you decide to cook the rice, it’ll still be delicious! 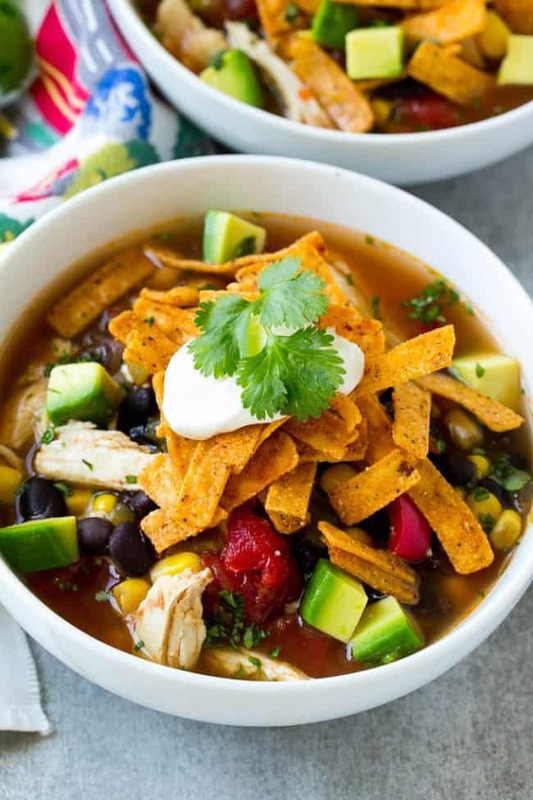 I often serve this soup with a side of cornbread or garlic bread for a hearty meal that satisfies even my most picky eaters. If you’re more of a chicken noodle soup kind of person, you can swap out the rice for egg noodles and add them during the last hour for a little different twist on this recipe. However you decide to serve it, it’s sure to be a hit! This slow cooker chicken and rice soup is an easy and comforting meal that's perfect for cold nights! Place the chicken breasts, onion carrots, celery, chicken broth, garlic, dried thyme, dried parsley, salt and pepper into a slow cooker. Remove the top and add the rice. Cook for one more hour on LOW or HIGH heat. Remove the chicken breasts from the soup and shred with two forks. Return the chicken to the soup. Hello to you young lady, I have been looking at the easy ways your show how to make , well just anything and they just make my mouth water. I am about to getsome of these things in the making and I just know they will all just come out perfectly. 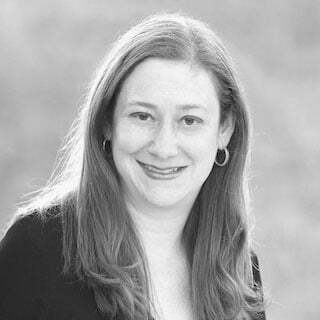 I want to Thank You for all your help that you give. Please keep up the good work. It look so delicious. It make me hungry. All your soups that you show us my mom always cook it for me. It’s very good for our healthy. Yum!! It’s my favorite soup. This looks delicious! My two kiddos and I are all sick with influenza, so I put this together tonight ready for tomorrow. This looks so comforting. I wonder if it would be better to sautee them before putting them in the slow cooker. The onions don’t seem to do well in the slow cooking recipe?? Do you add cooked white rice or uncooked white rice for the last hour? I typically add the rice during the last hour of the cook time. Another alternative is to simply stir some cooked rice in right before you’re ready to eat. However you decide to cook the rice, it’ll still be delicious! Do you have the calorie count? I’ve looked for the crack chicken and rice soup you have a picture posted on the first page, and l give up. Couldn’t find it .